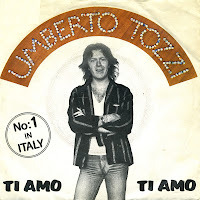 The Italian singer Umberto Tozzi had a European hit with 'Ti amo' in 1977, a track that is still played on radio stations that specialize in mushy, romantic classics. However, there was also a Spanish version of the track, released on this Spanish 7" single. I've got a feeling that this track is sung with an unmistakable Italian accent, but my Spanish is not good enough to judge this. Still, it is quite a rare track, and that's what always interests me: rare stuff. 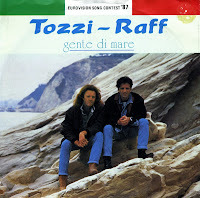 Umberto Tozzi and Raffaele Riefoli represented Italy during the 1987 Eurovision Song Contest with the song 'Gente di mare' ('People of the sea'). It was a decent effort - although at the time I thought the song was unspeakably boring - reaching third place in the Contest. While not winning the Contest the song achieved considerable popularity, becoming a Top 10 hit in most parts of Europe and Scandinavia in the summer of 1987. In the Netherlands, the single peaked at number 20. In 1977, Italian singer Umberto Tozzi released one of his most famous songs, 'Ti amo'. 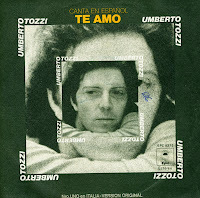 It stayed at number one on the Italian charts for seven months, outselling every other record, and went on to become an international success throughout continental Europe. It also made some inroads in the Americas and Australia, primarily in discotheques.